Happy Darwin Day to ye! Over at Rosetta Stones, I have a juicy selection of quotes from Charles Darwin on that most beautiful of sciences, geology, which he loved. There’s cake and dinosaurs, too! Let’s pretend, for just a moment, we can send a letter to the past. And yes, I know this is being posted the day after his birthday, but the Seattle Skeptics et al are celebrating it today. Shall have pictures up from that happy event in the not-too-distant future, but what is future or past for those of us who can send letters to Victorian England, eh? Greetings from the year 2011! I hope this letter finds you well, perhaps enjoying a lovely day on the Sandwalk, and that the sudden appearance of my missive hasn’t startled you too badly. I know this is highly irregular. However, I felt it important you know that your many long years of work have not gone unappreciated. Other, more capable, people will be writing you to show you what your theory of evolution has become. Needless to say, it’s grown and flowered, and is now the major unifying concept of biology. It’s allowed us to make enormous strides in our understanding. It’s been used to save lives, unlock the mysteries of our origins, and has proven to be one of the most powerful theories in any scientific discipline. You, sir, would be astounded to see what came of your ideas. And I hope you would be pleased. I wish I could report that you’re universally appreciated, but alas, the forces of ignorance have not yet raised the white flag of surrender, although they’ve suffered an embarrassing number of decisive defeats. I have to thank them, though. Without them, I may never have become interested in evolutionary biology, or read your beautiful book. I’m ashamed to admit that I knew little more of you than your name. I knew some basics of evolution, and I knew that you had put the basics in place. I knew you had discovered natural selection. But I didn’t much care. Biology, you see, was full of squidgy organic bits, and I didn’t much like squidgy organic stuff. But then, while suffering from one of the worse cases of influenza I’ve ever experienced and looking for things to distract me from the misery, I stumbled across some information on the people fighting to keep evolutionary biology out of schools. I discovered people who disparage your name and intend to drive all trace of your theory from the classroom, in favor of creationism, which some people have tried to dress up by calling “intelligent design.” I can assure you there’s nothing intelligent about it. It is, in fact, creationism’s Trojan Horse, and the arguments marshaled against your elegant theory of evolution are tiresome to the extreme. They like to pretend, but they really haven’t advanced their arguments past William Paley, whereas scientists have built skyscrapers on the foundations you provided. Well, I’m a writer, and I’ve always loved a good conflict. So I abandoned my original purpose, which had been to fill some holes in my own appalling ignorance, and gleefully jumped into the fray. I read everything I could find. By the end of it, I’d learned more of evolutionary biology than I’d ever suspected I would, and I’d discovered you. No one in my education had ever told me about your life. I didn’t know your origins, the fact that you’d started out destined for the clergy, or the circumstances behind that famous voyage on the Beagle. * Some bare facts had been given, but all the romance, the thrill of discovery, had been drained from them. I learned of your adventures, your doubts, and the dawning of your understanding, and I became enthralled. I’d never known you were such an interesting man. I’d never known how hard it was for you to gather the evidence needed to verify your theory. And I’d never realized you were such a talented writer. At last, I picked up your On the Origin of Species, and read it cover to cover. True, evolutionary biology has advanced far beyond what’s contained in those pages. We now know the answers to many of the things that perplexed you. But to appreciate how very far we’ve come, it’s good to understand where the journey started. Besides, the Origin is a pure delight, a tour de force, a beautifully reasoned tale of discovery. Your arguments are elegant, your evidence copious, and everything laid out in a clear manner. No wonder T.H. Huxley exclaimed “How extremely stupid not to have thought of that!” upon hearing of natural selection. It takes an act of willful blindness not to see the truth in those pages. Alas, all too many people seem to delight in stabbing their eyes out. But for every one of them, there are thousands who, because of you, can see this world in all of its infinite complexity with new eyes. As one of them, I can tell you that you’ve made it possible for me to view even the humblest of creatures with wonder and delight. What a story they all have to tell! How far we’ve all come from that warm little pond (although we’re not altogether clear on whether it was a pond, exactly – it might have been a hydrothermal vent, or something else we’ve not yet imagined. We’re still on a voyage of discovery, and someday, one or more of your intellectual descendants will find their own Galapagos, I’m sure). And to think geology had something to do with it! Geology is one of my especial delights. Imagine, then, how thrilled I was to learn that Mr. Lyell’s Principles of Geology accompanied you on your voyage, and assisted you in your discoveries. I hadn’t imagined, back when I was still toiling along in near-ignorance, that things so seemingly different as geology and biology are so intimately connected – and in more ways than just sharing two giants who revolutionized our understanding of those fields. I have only to think of limestone, for instance. But just as our understanding of evolution has advanced since your time, so has geology advanced since Lyell’s, and you would, I’m sure, be fascinated by the theory of plate tectonics and how the movements of continents have affected evolution. Without you, Mr. Wallace and Mr. Lyell, none of that would be known to us. I grant you, someone else probably would have made these discoveries in time, but how long would we have had to wait? Long enough, I fear, that the scientific vista I enjoy now would have been much smaller. Mr. Darwin, I feel it’s important for you to know just what a profound impact you’ve had. It’s not a stretch to name you as the father of modern biology. (And yes, I know you will say Mr. Wallace deserves no small share of the credit, and indeed he does, but today is your birthday, and so we are celebrating you.) You are a remarkable scientist. A happy birthday to you, and many happy returns! *Special thanks to The Beagle Project Blog for this link. Although I won’t be celebrating his birthday until tomorrow, I figured I’d at least get in some birthday wishes. Take a moment today to appreciate a truly great man of science. And what better way to celebrate the occasion than with a cake in the shape of a Galapagos tortoise? I can’t do his life story or his gargantuan contribution to science justice in one small post, so I won’t even try. Instead, I’m celebrating the day with some fun facts, awesome quotes, and celebratory pictures that link you to stories about Darwin’s life, science and legacy. In reality the famous Sand Walk (see fig. 1) that is known to have been so important to Darwin’s work started at the back of the house and continued along in front of the green houses and kitchen gardens to the west end of the great meadow where it turned left and disappeared into a small woods that Darwin himself had created. 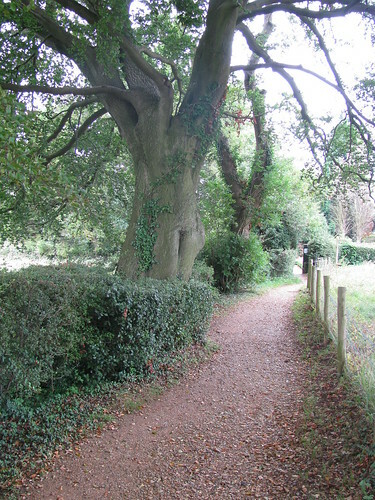 Darwin has described how he would take a ‘daily constitutional walk’ along this path while he thought about the meaning of the observations he was making and about the ideas they generated. We can only speculate on how important the sand walk was to the development of the Theory of Evolution as it took shape in the consciousness of his mind over more than 20 years. Darwin frequented the chalk downland close to where he lived. ‘Orchis Bank’, now Kent Wildlife Trust’s Downe Bank, was a favourite place of his. The studies of wild orchids formed the basis for his explanation of the co-evolution of flowers and their insect pollinators. The site is thought to have inspired his vision of a ‘tangled bank’ in the conclusion of The Origin of Species, a passage which emphasises the intricate interrelations of different species. The famous sketch on the right is from Notebook B and depicts the branching system of descent with modification which Darwin realized could explain the relationship between different species in the same class or family. The most ancient forms are at the bottom and their descendants branch off irregularly. The lines with a crossed end are existing species and those without represent extinct species. Charles Darwin was one of science’s most inspired thinkers. The greatness of his contributions cannot be understated. His insights into the mechanisms of evolution serve as the foundation for all of 21st century biology, as well as many other fields of study such as psychology, biochemistry, epidemiology, paleontology, anthropology, sociology, philosophy. In addition, his ideas and discoveries strongly influenced the development of statistical methods of data analysis that are now in widespread use in the sciences, economics, and politics. In other words, the effects of Darwin’s work were multidisciplinary as well as far-reaching and long lasting. Happy birthday to the man who showed us “endless forms most beautiful.” Many happy returns, old chap!